This time of year is when we naturally look back and reflect and maybe reminisce. This may be to do with career, diet, exercise or relationships. We have seen a rise in technology for recording everything we do and there are many apps that aim to help us improve physical and mental wellbeing to monitoring diet, sleep and steps and now reflection in an aim to boost our moods. In general reminiscing can be a positive activity that we inherently do whether we mean to or not. Showing reflection on positive memories can elevate a current low mood state and interestingly reflecting on negative events when in a positive mood leads those prior negative events to be viewed more positively. So, can we actually aim to improve our mood? Scheduling activates that we know make us happy and we know we will look forward to is a great tactic that has been found to be among the most effective treatments for depression. Thinking about spending an evening with a good friend might elevate mood throughout the day. Also, doing that early morning exercise may have long-term happiness effects as it creates a positive mood throughout the day. Of course, in this cold weather getting out of bed earlier than needed before the commute is arguably a negative mood changer! Give it a try though – it might change the course of your day for the better. Social media apps are already built to help us remember happy moments, events and photographs. EmotiCal in particular encourages active reflection by evaluating exactly which activities have affected our mood. Is this progress we may wonder – or is it just another way to connect to technology when we should be connecting with humans? Similar intervention methods for positively boosting moods have been explored in psychology. These studies are great as they show which types of activities influence mood. Active reflection can be a really useful tool and include strategies such as, expressing gratitude, writing about gratitude, focusing on meaningful goals, savouring the moment, replaying happy days, performing acts of kindness, nurturing relationships and considering how we can improve ourselves. Here are some tips for your active reflection to help you start an amazing 2019. Release judgment – look back on any memories of closed mindedness as this can help you move forward with an open mind. Practice empathy to help solve problems that the past may have created. At times we may loose our way and you may forget your intentions. Life has a habit of throwing unexacting thins into the mix. Remind yourself of why you decided to walk your path, you become reinvigorated with the same powerful energy of intention you set as you started out. Whilst we don’t want to spend time dwelling, use negative memories or cycle to create positive reflection and move forward. Ask yourself why they happened and if there is a lesson you can take from your struggle. When it’s brought to your attention you be stronger. Its fantastic to be ambitious and want more and the best out of life – but in our fast paced and often all consuming lives we must take mindful moments to be thankful for what we already have. It’s the simple things that really make us tick – not social likes, money or possessions. Sit down and write five to ten things that you are truly grateful for. 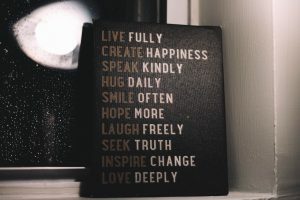 Do this as a daily practice and see how this can positively influence your life as you jump into 2019. Our Masterclass in January is all about setting intentions and exercise programming – join us for our event, we would love to see you there.